CT is completely confused and thinks it’s springtime. this is not a problem until tomorrow when it decides it’s winter again and we have to deal with the cold. makes me kind of grumpy. I’m going to enjoy the nice weather today though. I can handle that. In celebration of this unseasonably warm day, I took the kids on a field trip to TJ Maxx. I know you were getting concerned that I had not had a TJ’s trip in the past 5 days. I did it for you guys. What DO you know. I found a couple deals. I put them all on together to save on pictures. I think you will enjoy what you see. I also think I’m not quite sure why this kind of fashion hasn’t caught on. it is the perfect blend of athletic meets trendy. I would call it athlendy. 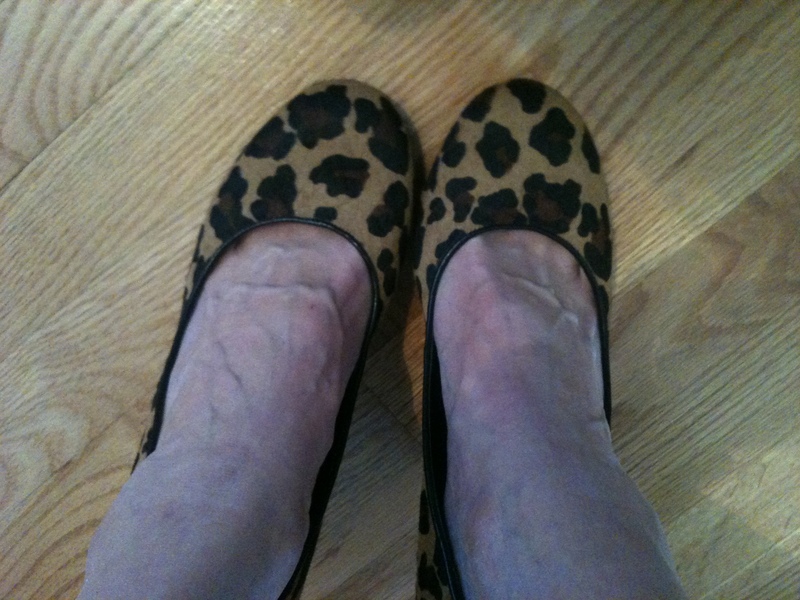 I like to wear my leggings 24/7, but I also enjoy a pair of snappy leopard print wedges. wardrobe staple. glad they are now in my wardrobe. I see no reason why I should have to decide between the two fashion genres and why I can’t enjoy them together. no one has done this look yet. watch for it. 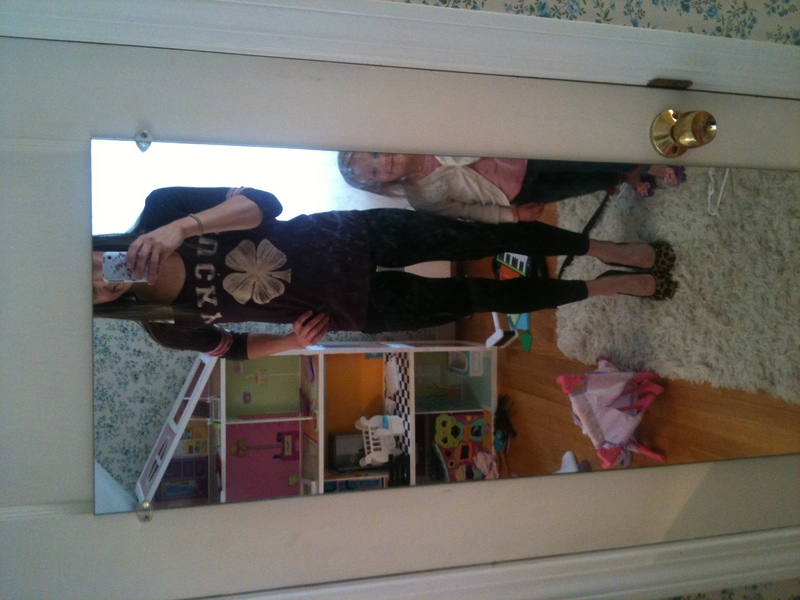 lucky brand cotton tee, another pair of black running leggings. never have too many. 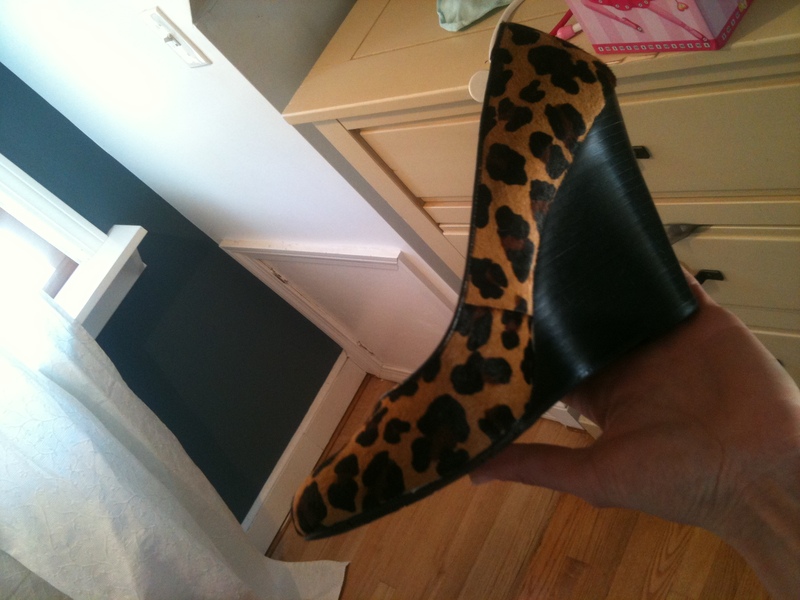 leopard print bcbg wedges. i’ve been eyeing those beauties – finally caught them on clearance. no one wears a size 10. i do. 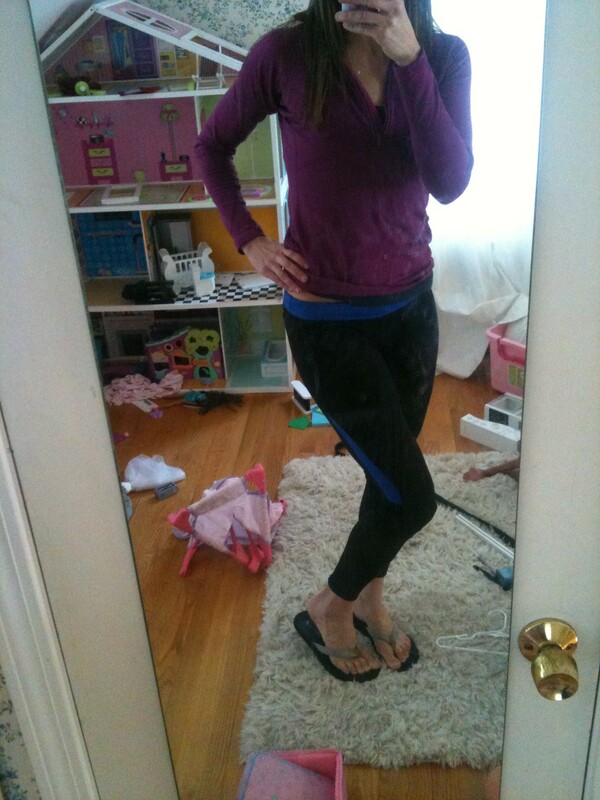 Why do I keep taking headless pictures in this dirty mirror? for some reason it happens to be the only full length mirror in the house and we never adjusted it higher for the tall drink of water that I am. so we get headless shots. simple really. surprise. not JUST another pair of black leggings. we've got some snazzy blue to jazz 'em up. good times. I know. I will never be a foot model. I have accepted that. it was only a matter of time before you realized I wasn't perfect and beautiful. i've got veins. big veins. 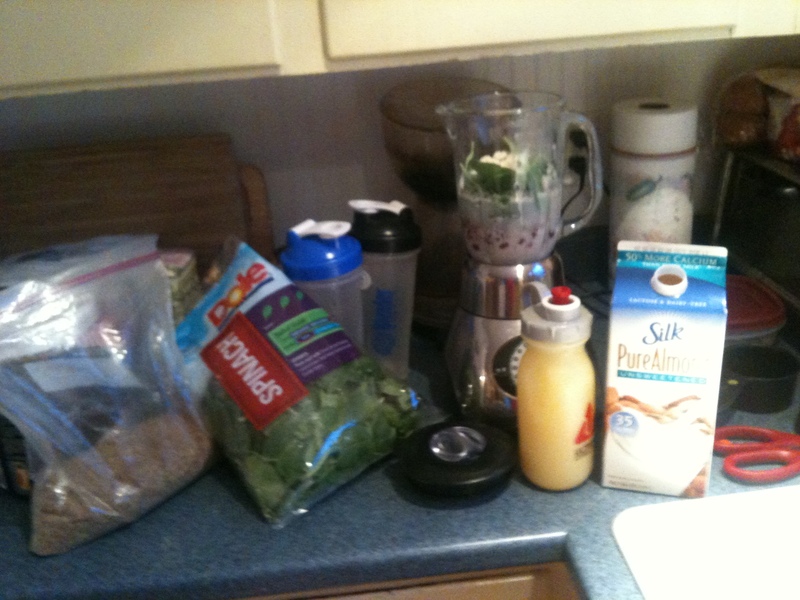 I’m sure you didn’t doubt that I would in fact make myself another green smoothie for lunch. I did. just like I said I would. I put a little more spinach in this one and no protein powder, so it was pretty green. but I still couldn’t taste the green! fantastic. getting so many veggies today, I can’t stand it. I do have a face! lacking mascara and eyeliner. I feel naked without mascara. i've been exposed. I even had a sweet potato with the green goodness. put it in saran wrap and popped it in the microwave for 5 min. sweet potato done. 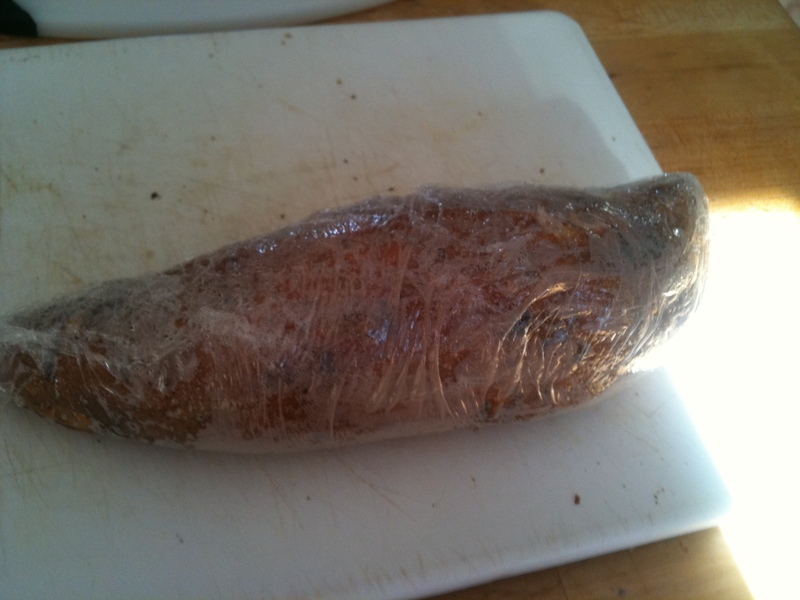 if a plastic wrapped potato in the microwave isn’t a recipe for cancer, don’t know what is. but I’m hoping the goodness of the sweet potato out-weighs the badness of the plastic in the microwave. fingers crossed. I think microwaves are just weird. but so convenient. that’s why I still use it. so appetizing, hmmm? but so easy to make. My body is so happy that I’m not finishing off the pot of Annie’s mac and cheese that I made the kids for lunch. I find that I get into this downward spiral of not actually making a healthy meal for myself and instead eating the crust of my kids sandwiches and cold macaroni. not good. I end up eating like a mother – leftovers from the kids. bad habit. I’m trying to make more a point of making myself a nutritious and delicious meal while I’m making the kids their lunch, or even better – right before. so that I’m not starving and eating all of their food. I need to remember to make my nutrition a priority as well. moms often go with the I didn’t have time to eat or I finished off my kids food so I’m all set or I forgot to eat excuse. I’m sure even non-mom’s do that. not sure whose kids they’re ripping off, but I’m sure those are some excuses of a poor diet for any old sam. of which I’m guilty. no longer. gonna have me some microwaved sweet potatoes and green smoothies. this week. we’ll see about next week. Any good shopping deals lately? Are you guilty of snacking all morning and calling it a meal? or finishing off your kids food? Workout – hit up the gym this morning. 4 easy treadmill miles. 20 minute strength circuit. I left Jillian behind today and made up my own super fantastic circuit this morning. I’m sure Jillian would be proud. I pick 4 or 5 exercises out of the recesses of my brain. not really the recesses, more like the ones that are front and center and pop out the fastest. I repeat them 3 or 4 times or until I get really bored. day 2 of sticking to the less is more plan. see you next week marathon training. job done. Little green monster has been harrassing me and screaming in my face ever since I walked back in the door. I haven’t figured out what to do with him yet. so I just keep feeding him sugar and hoping he will crash eventually. I went to the grocery store yesterday and actually had a LIST and dinners planned out for the week. mind blowing. I don’t know what happened to me. there is actually a possibility that I won’t have to go to the store 12 times this week. I might have gotten my act together yesterday. still TBD. to be determined. This blog – Oh She Glows – is quickly becoming one of my favorites to pull recipes and ideas from. That’s where 3 of my dinner meals came from this week. 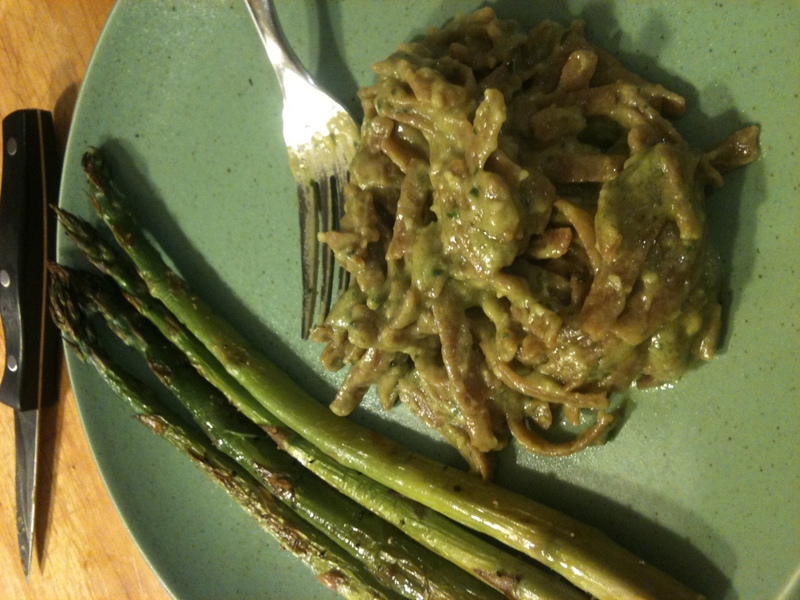 Last night I made this 15 minute creamy avocado pasta. I’m not going to say any thing more about it other than – go make it. go make it. now. the only other thing I will say about it is if you don’t like sprouted grain pasta or ancient grain pasta, use something else. like barilla plus. other than that – go make it. of course I doubled it. I double everything. so good. and so green. 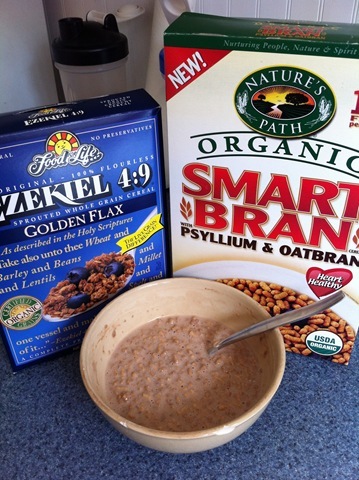 I used sprouted grain Ezekiel pasta. wouldn't do it again. and my food pictures have not improved. don't expect them to. ever. I have a couple more recipes lined up from her and one from Food Network. then I’m banking on leftovers and a couple nights of spontaneous plans that get me off the dinner hook and through the week. I will share as the week goes on. 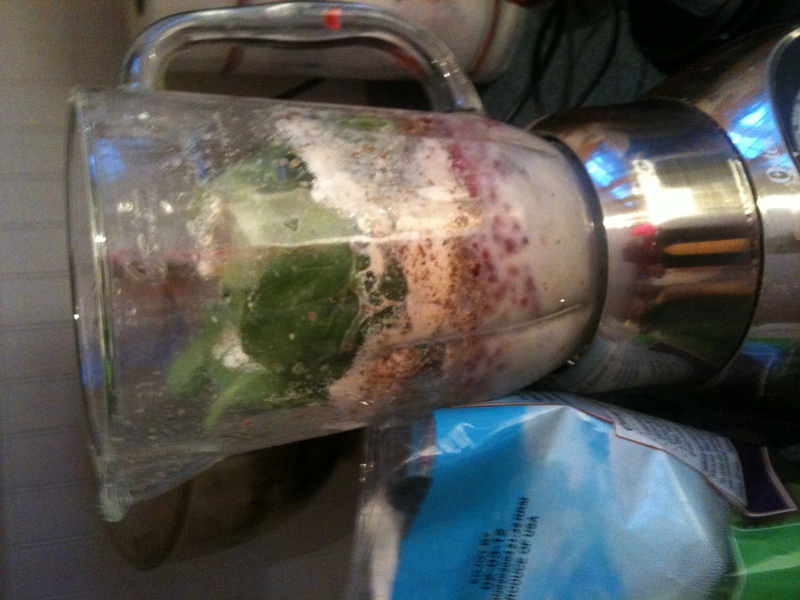 To keep the green thing going, I thought I’d try a green smoothie this morning for breakfast. I know I’m like 10 years behind on this one – but Oh My Goodness!!! It was good!!! Spinach and everything. counter full of life. look at all that healthiness. whoa. almond milk. flax. spinach. frozen raspberries. protein powder. ice. was going to do p.b., but that might have been overkill. I think I’m going to have to make this one again today. and for breakfast every morning until I can’t stand to look at my blender anymore. yum. 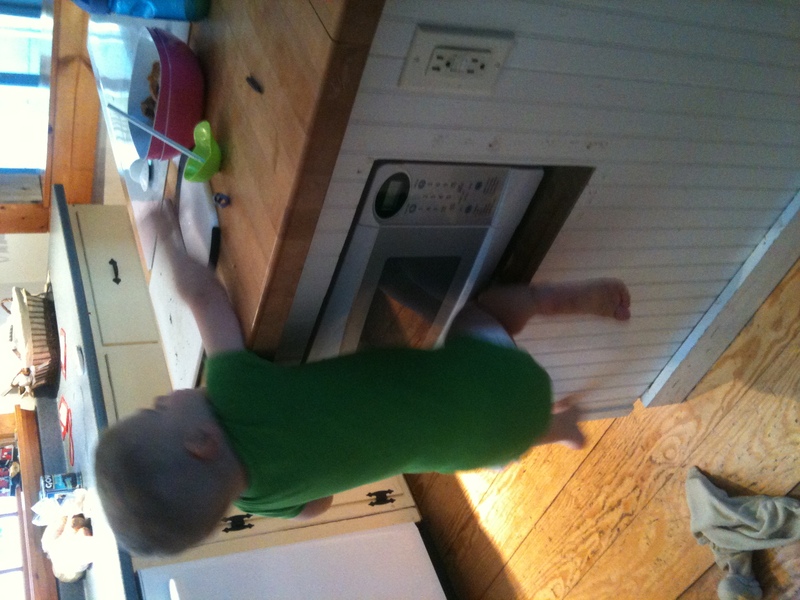 And here’s a little trick my daughter did this morning – little nifty spiffy pants that she is. magic. 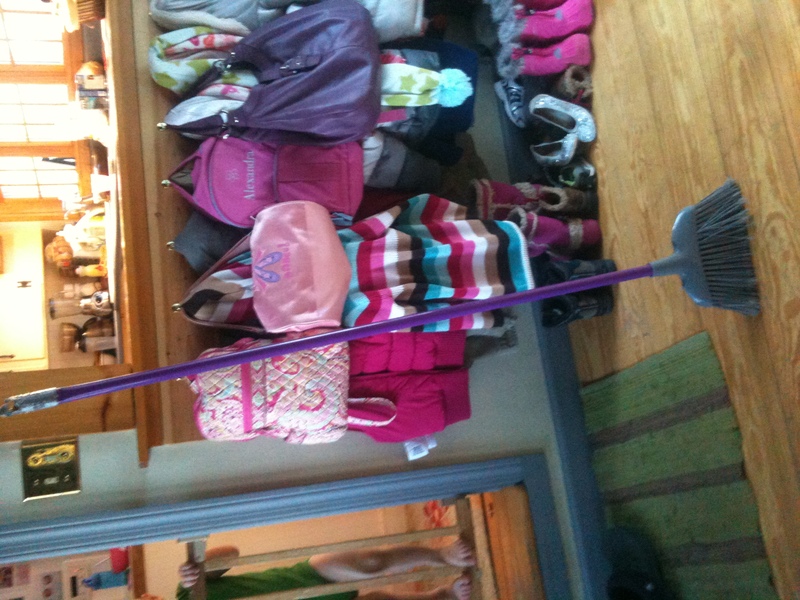 she made it stand up all by itself. we are so proud of her. and her many accomplishments. tell me that's not impressive. I might be easily amused. Upward and onward with this day. It is supposed to be in the 50’s here?!?! That might force me outside for another little run later. but probably not because I have 3 kidlings that need tending to. good thought though. Do you like to make green smoothies? 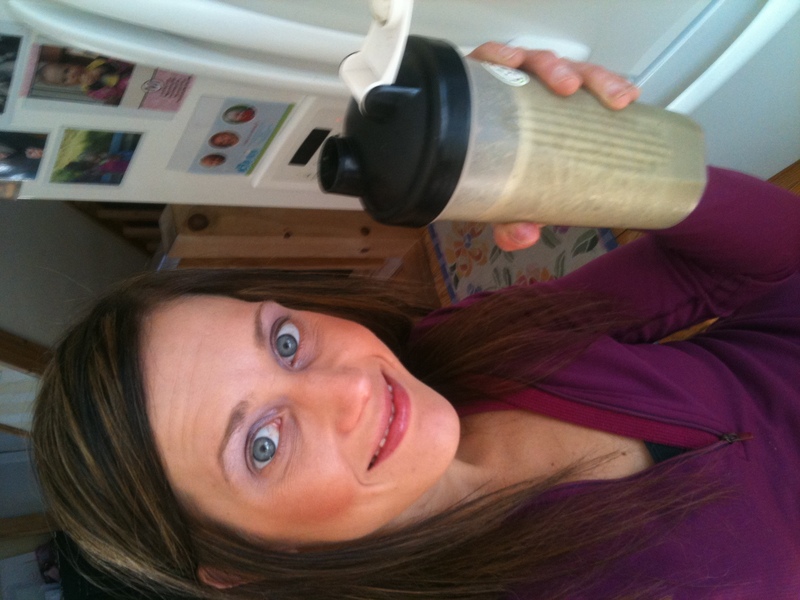 What is your favorite smoothie recipe? Where do you get your dinner inspirations from?